Click on the [Add] button, the Profile Heading or Right-click in an empty section of the Profile Items pane. From the right-click menu, choose the item type. Note: If you right-click on any of the subheadings in the Profile Items pane, the same right-click menu is displayed, but the item type that you have clicked on is displayed at the top of the menu. You will be directed to a screen asking for supporting information. The fields for you to fill in will differ depending on which item type you have selected. The new Profile Item will be displayed in the list. If you create a new item that is inconsistent with another item already in the list e.g. 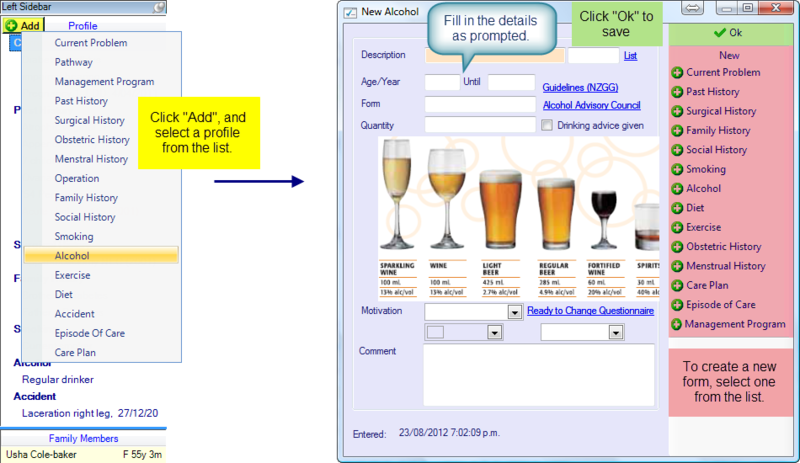 under Alcohol you create an item stopped drinking alcohol where previously the person is listed as a heavy drinker, the new item will replace the old item in the list.